The chills cut through you like daggers of ice in Bracken MacLeod’s STRANDED, a brilliant tale of Arctic horror with echoes of John Carpenter’s The Thing and the historical tragedy of the H.M.S. Terror. 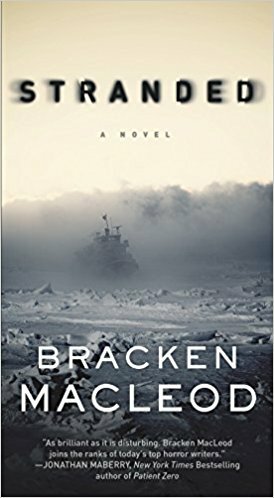 What starts off as a survival thriller veers into nightmare territory as Noah Cabot, deckhand of the Arctic Promise, watches his crewmates succumb to a bizarre illness after a storm sends the ship into a preternatural fog. Ice locks in the ship and paranoia grips the crew, who soon begin to see things that shall not be revealed. Noah and the strongest of the crew head across the ice, after they catch sight of a structure in the distance. They pray their trek through the frozen waste will lead to their rescue, but what they find is a puzzle as dreadful as their secret selves, with a signpost up ahead -- “this way lies madness.” –R.J. Crowther Jr.
BRACKEN MACLEOD is the author of MOUNTAIN HOME and WHITE KNIGHT. His short fiction has appeared in several magazines and anthologies including, Shock Totem, LampLight, ThugLit, and Splatterpunk. He has worked as a trial attorney, philosophy instructor, and as a martial arts teacher. He lives in New England with his wife and son, where he is at work on his next novel.